Jordan Horton Lyles (born October 19, 1990) is an American professional baseball pitcher for the Colorado Rockies of Major League Baseball. 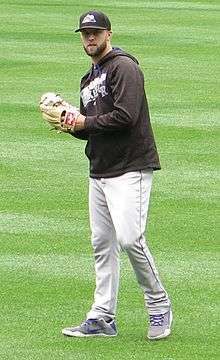 He previously played for the Houston Astros. Lyles attended Hartsville High School in Hartsville, South Carolina. In his junior baseball season, he led the Red Foxes to a 4A championship, compiling a 6-1 record and 0.85 ERA. He went 7-2 in 2008, recording a 1.86 ERA and 89 strikeouts in 60 2⁄3 innings. As a hitter, Lyles hit .447 with 6 home runs and 20 RBIs. In football, Lyles set single-season school records with 81 catches for 1,568 yards and 23 touchdowns. He was selected by the Astros with the 38th pick in the 2008 Major League Baseball Draft out of high school. After signing, Lyles "showed a consistent 90-mph fastball and had 64 strikeouts in 49 2⁄3 innings in the rookie-level Appalachian League," according to sportswriter Gerry Fraley. In 2010, Baseball America named Lyles the Astros' top pitching prospect. That season, he appeared in the All-Star Futures Game. Lyles had his contract purchased by Houston on May 28, 2011. 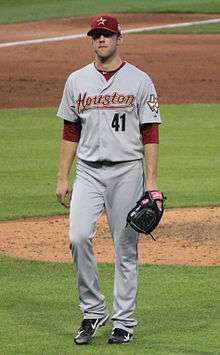 His first start with the Houston Astros came at Wrigley Field on May 31. He pitched 7+ innings and allowed only one earned run in a 7–3 win. He also got his first career hit that game. Lyles recorded his first major league win August 3, 2011 in a 5–4 win over the Cincinnati Reds. The Astros optioned Lyles to Oklahoma City at the start of the 2012 season. On April 29, Lyles was recalled to Houston to make a start for Kyle Weiland, who was placed on the 15-day DL. Lyles was 4–0 with a 3.46 ERA with 24 strikeouts in 26 innings at Oklahoma City. Lyles pitched a quality start, giving up three runs over six innings of work. Though he left with the lead, the bullpen lost control, and the Astros lost, 6–5. After the game, Lyles was optioned back to Triple-A to make room for Marwin González, who was activated from paternity leave. On December 3, 2013, Lyles, along with outfielder Brandon Barnes, was traded to the Colorado Rockies for outfielder Dexter Fowler and a player to be named later. On January 14, 2015 Lyles and the Rockies avoided arbitration, agreeing to a one-year contract worth $2.475 million. On June 1st, Jordan was placed on the 15-day disabled list with a sprained left toe. On June 3rd, it was declared Lyles would need toe surgery, effectively ending his season after just 10 starts. Lyles typically throws five pitches: a four-seam fastball at 91–94 mph, a two-seam fastball at 90–93, a cutter at 85–88, a curveball at 78–82, and a changeup to left-handed hitters at 82–84. Lyles has also thrown a small number of sliders. He is not a strikeout pitcher, but his pitches have good ground ball/fly ball ratios. ↑ Bezjak, Lou (June 6, 2008). "Astros select Hartsville's Lyles". The Morning News. Retrieved August 19, 2014. ↑ Fraley, Gerry (January 12, 2009). "Cooper ready to lead Astros on smoother trip". USA Today. Retrieved 2009-01-21. ↑ "Lyles Named to Futures Game". MILB.com. June 22, 2010. Retrieved August 19, 2014. ↑ McTaggert, Brian (June 22, 2010). "Lyles to get a taste of future in Anaheim". MLB.com. Retrieved August 19, 2014. ↑ "Lyles to appear in Futures Game". MILB.com. July 2, 2010. Retrieved August 19, 2014. ↑ McTaggert, Brian (May 28, 2011). "Wandy heading to DL, Astros will promote Lyles". MLB.com. Retrieved August 19, 2014. ↑ "Impressive Jordan Lyles settles for no-decision as Astros rally by Cubs". ESPPN.com. Associated Press. May 31, 2011. Retrieved August 19, 2014. ↑ "J.D. Martinez comes through in clutch to lift Astros past Reds". ESPN.com. Associated Press. August 3, 2011. Retrieved August 19, 2014. ↑ McTaggert, Brian (April 2, 2012). "Astros option Lyles to Oklahoma City". MLB.com. Retrieved August 19, 2014. ↑ "Astros recall Lyles, will start Sunday". Chicago Tribune. Reuters. April 28, 2012. Retrieved August 19, 2014. ↑ Wallner, Jeff (April 29, 2012). "Lyles solid in debut, 'pen can't hold on". MLB.com. ↑ "Astros acquire OF Dexter Fowler". ESPN.com. Associated Press. December 3, 2013. Retrieved August 19, 2014. ↑ McTaggert, Brian (December 3, 2013). "Astros add Fowler, send Barnes, Lyles to Rockies". MLB.com. Retrieved August 19, 2014. ↑ "Stubbs, Lyles, Chatwood agree to deals with Rockies". ESPN.com. Associated Press. January 14, 2015. Retrieved January 15, 2015. ↑ "Brooks Baseball · Home of the PitchFX Tool - Player Card: Jordan Lyles". Brooks Baseball. Retrieved 4 September 2012.